daffodils: Mixed media door hanger. Today I want to share with you a mixed media door hanger I made from a wine tag die from Die Cuts and More. I had made this for my DT post for DCAM. I die cut a watercolor paper and prepared the back ground with texture paste using stencils, stamping and splatter of white gesso. I used script stamp from Kaisercraft and Grunge effect stamp from Mudra. I added an MFT doily die cut and added the handmade flowers and mdf flourishes. I added laces from Papericious and a butterfly fussy cut from Bob n Betty pattern paper. Added the Eiffel Tower resin embellishment and tied an organza ribbon. I printed the quote and inked the edges for a vintage effect. This is fun and pretty, Gayatri. What a great sentiment and a perfect door decoration. 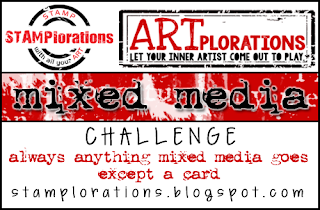 Thanks for playing along at STAMPlorations' Mixed Media Challenge. I love love love it! The door hanger looks beautiful. I love the shabby look and elements used. Glad you joined STAMPlorations January Mixed Media Challenge and see you next time. Love the feminine look of your door hanger, Gayatri, most of all your sentiment! Thanks so much for playing along at STAMPlorations Mixed Media Challenge. Good Luck!